VORNADO REALTY TRUST (NYSE:VNO - News) announced today that its Board of Trustees has declared a regular quarterly dividend of $0.95 per share, payable on March 12, 2009 to common shareholders of record on February 5, 2009. In recognition of the current state of the economy and capital markets, the Board of Trustees has determined to augment the Company’s best-in-class balance sheet by paying this dividend in a combination of cash, not to exceed 40% in the aggregate, and common shares. This dividend policy continued for all of 2009 will enable Vornado to retain approximately $390 million of additional liquidity to further enhance its ability to take advantage of opportunities and protect against uncertainties in the capital markets. In accordance with Internal Revenue Service procedure, shareholders will be asked to make an election to receive this dividend all in cash or all in Vornado common shares. To the extent that more than 40% cash is elected, the cash portion will be prorated. Shareholders who do not make an election will receive 40% in cash and 60% in common shares. Not good... I can only imagine how bad the New York office market is going to get in 09. Thankfully they have Washington D.C. which is set to grow exponentially when He arrives. 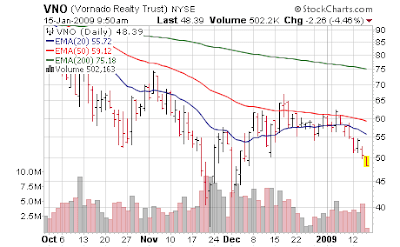 Vornado Realty Trust operates as a real estate investment trust (REIT). As of December 31, 2005, it owned 111 office properties aggregating approximately 30.7 million square feet in the New York City metropolitan area, as well as in the Washington D.C. and Northern Virginia area; 111 retail properties in 9 states and Puerto Rico aggregating approximately 16.2 million square feet; and 10 properties in 6 states approximately 9.5 million square feet of showroom and office space.